This recipe is very adjustable as in the size of your pot. The best way to use this to not only help your diet but save money is to make up a large quantity and freeze it in containers for a quick lunch. So reduce or alter the quantities I have suggested. TBH with soups it very difficult to get it wrong. As long as it is not watery (in this instance) and has flavour you will be fine. 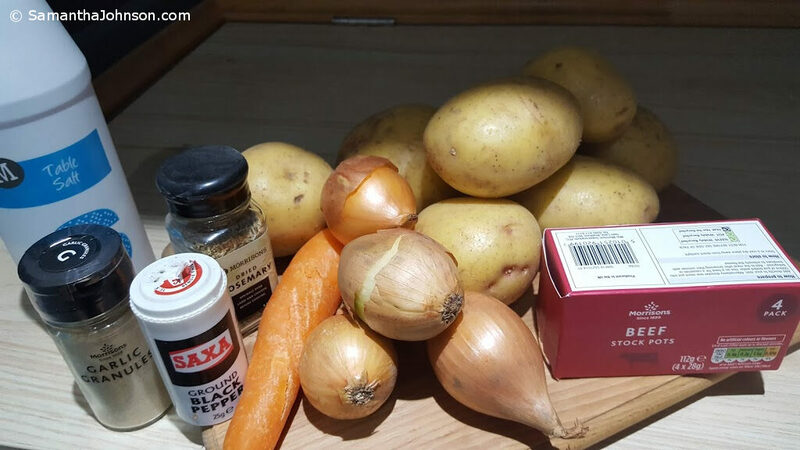 Potatoes (enough to fill your pot or pressure cooker 3/4 full). Onions (Approx 1/4 of the potatoes). Good pinch of Rosemary (or your preferre herb, some may like Sage, Cilantro or even Oregano for Pizza flavour lovers). 2 Stock Pots (or cubes). Peel Onions and cut cut into quarters. Do not fry in oil! They will cook in the water. 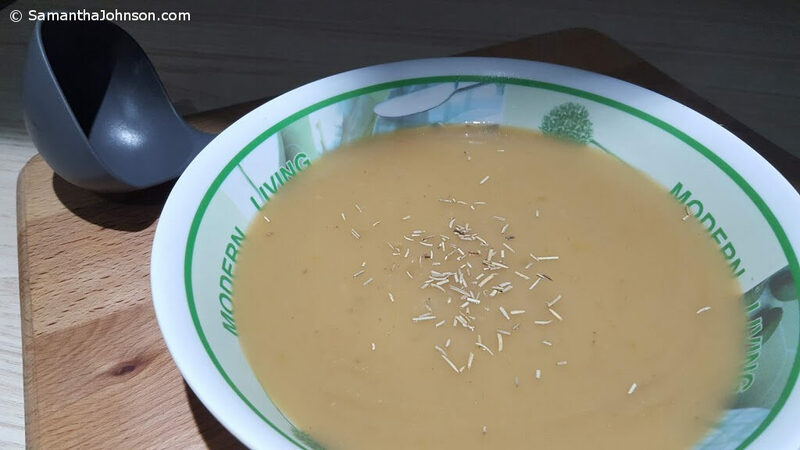 Roughly Chop Potatoes skin on for more roughage, vitamins and minerals (Peeling is optional for a whiter soup especially if you do not have a liquidiser). Throw in Stock Pots, Garlic and Herbs. Add Salt (add more salt when finished to taste). 2 Litres water and bring to boil or set pressure cooker to Soup and allow to cook (approx 30 mins simmering). Allow to cool slightly ensure there is enough fluid to liquidize. I use a hand blender in the same pot as its easier and less washing up! But you can use a blender or food processer if you have one. If you do not own a blender of any kind it is important to finely chop all the ingredients at the beginning. But if you plan of making a lot of soups on the Potato Diet then buy a hand blender (they are very cheap). Liquidise till smooth taste and adjust with water until satisfied with the consistency. Taste and add salt until flavoursome. Allow to cool and ladle into plastic containers and freeze until required. This made 6 massive portions of soup. And this makes meal planning a lot easier as you would only need to plan maybe one or two meals a day with this available if you feel lazy. 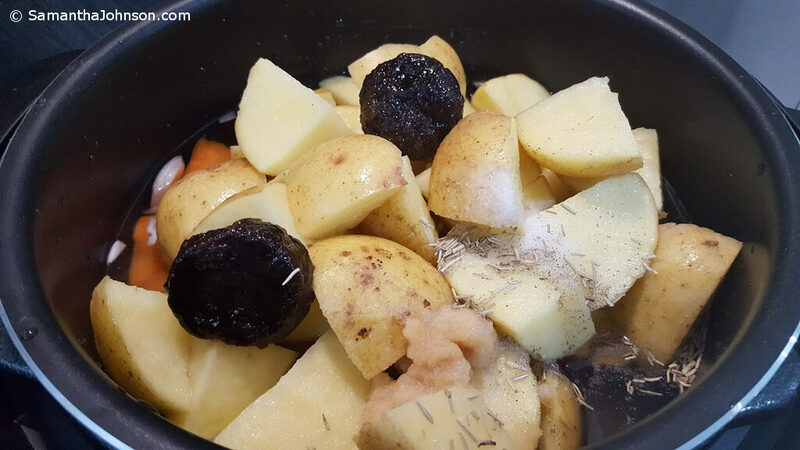 You can add chopped potato pieces to this for some bite if you have any left over from the day before such as jackets or boiled spuds. This can be a starter to another potao dish or eaten as breakfast or lunch.